Patitiri is the island's harbour and the first place you see when arriving at Alonissos. It is the capital and the centre of the island. "Patitiri" means winepress and the village got its name from the fact that all winepresses and storage places of the wine of Alonissos used to be in this area. Roussoum Yialos is the most popular beach for swimming in the area; 7 minutes walk from Votsi and only 5 minutes from Patitri, Roussoum Yialos is the nearest beach to IKION. You can enjoy delicious local dishes in the tavernas along the beach after swimming. Rsum in Turkish means tax. The explanation about the name Roussoum is because the products of the island, especially the wine, were shipped from this place and that's why taxes were collected there. The small fishing harbour of Votsi is located to the east. It was a separate village a few years ago. There is a small and quiet beach where you can swim. You can also enjoy yourself at the nice tavernas overlooking the clear blue-green sea. The Old Village is very attractive and fantastic with one of the best sunsets in Greece. Because of its location at the top of the hill, the views are fantastic indeed. Because of the traditional character of the village and the special style of the buildings this place is the best spot on the island. Kalamakia located 12 km from Patitiri is the eastern fishing village of the Northern Sporades. 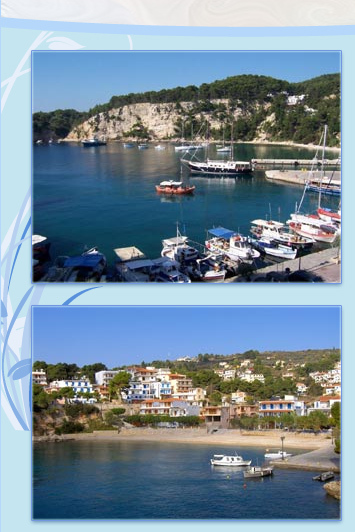 The village is popular for its fresh fish and lobsters served in the waterside tavernas all owned by the fishermen.